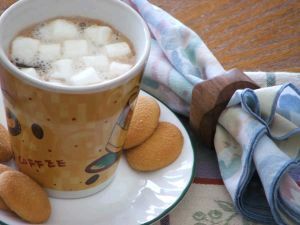 This is a nice variation on the usual Hot Chocolate Jar Mix recipe. Both versions are very good, but cinnamon is a healthy addition to the ingredients, and appealing for those who love the taste and fragrance of this popular spice. You will also need 3/4 cup of hot milk. In a large bowl, thoroughly stir together milk powder, sugar, cocoa, creamer and cinnamon. Gently stir in marshmallows. Pour Cinnamon Hot Chocolate Mix into an airtight jar. Can be stored in a cool, dry place for about three months. If giving this mix as a gift, tie two or three cinnamon sticks around the rim of the jar and attach a gift tag or my Free Printable Cinnamon Hot Chocolate Mix label. 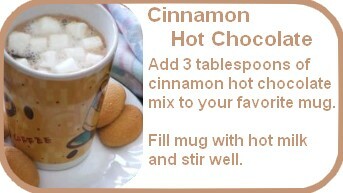 To prepare cinnamon hot chocolate, dissolve three tablespoons of mix in 3/4 cup of hot milk.